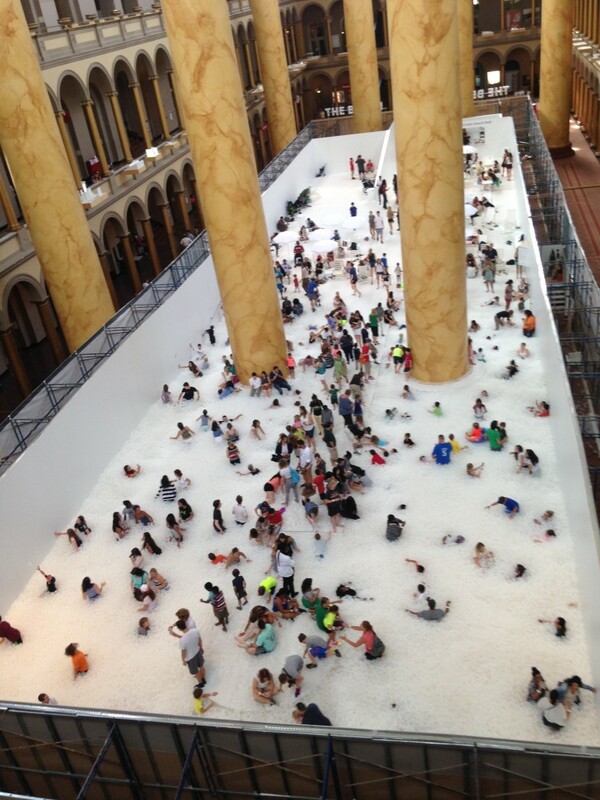 The last official beach day of the summer is also the last day for “The Beach,” the terrifically popular installation at the National Building Museum by Snarkitecture, which I’m so proud to say is run in part by my stepson Alex Mustonen. I had heard of his idea of following up last year’s popular BiG Maze at the Building Museum with their own interactive fun months ago. It fit both the Building Museum’s desire to bring a big fun family happening indoors at its massive atrium (they had architecture-designed miniature golf in previous years) and the Snarkitecture aesthetic. That meant eliminating the color to both alter the experience and to give a definition to the shapes in white, but also using balls. Little orbs have long been part of the practice Alex started with artist Daniel Arsham after graduating from Cooper Union more than a decade ago. Thousands of ping pong balls animated Jonah Bokaer’s dance piece “Why Patterns,” performed in Rotterdam and at Jacob’s Pillow in the Berkshires. Forty-five weather-balloon sized spheres danced in a New Museum gala piece, “Lift.” One of their first pieces of furniture was an architectural Slab Table that also served as a regulation ping pong table (and serves in their Greenpoint, Brooklyn studio as such, as well as a conference table). Ping pong balls — which have also been part of Arsham’s own cloud like sculptures, which can be seen at the Walker Art Museum and other places — have the benefit of already being white — the studio’s signature. But the team also produced white basketballs for a pair of white shootout arcade games installed at a stylish car park during Art Basel Miami Beach. That was the same year they also had an oversized, super complex marble run at Miami’s Delano Hotel — the whole Rube Goldberg contraption was painted white, but in this case the marbles that ran down them were black. Just turning the thousands of plastic orbs of a Playland ball pit white wasn’t enough for “The Beach.” They found a company that made softer translucent pit balls that didn’t hurt or sting if someone violated rules and slung one at you. They also made the experience of jumping into four feet of them an inevitably soft landing. Not that it made it easy to get out. Just as in the actual ocean, there can be some struggle to regain footing even if there are no waves regularly crashing in. One struggles at first in the balls just as one does in the water. And nobody gets wet. And this is the secret of “The Beach” and the reason it became a bigger exhibit than anything else in museum heavy D.C. during its run — and by far anything in the National Building Museum history: It was Selfie Heaven. Here at last was a chance to jump in and splash around and still hold one’s camera phone to capture it all for every corner of social media. Rare is the Facebook user anywhere with a friend visiting D.C. who did not see such a picture. Instagram was stuffed with such shots, and for good reason: It sponsored the pre-opening event the morning of July 4, igniting pixels everywhere. The fun of “The Beach” is the glee in the people taking part — from the very young to the very old; hipster to tourist; people on dates; and full extended families. From the very moment it opened to the public that holiday morning, lines formed with hundreds wanting to take part. And the lines stayed ever since. People went back multiple times. Online tickets sold out weeks ago. Every posted selfie was promotion for someone to get there or go again. People planned trips to D.C. specifically to experience it. The maze was considered a huge hit last summer with 50,000 visitors — this one had more than three times that. The other good thing about “The Beach” was that, as at the shore, you could just go up to the edge and put a toe in if you wanted. The white AstroTurf had a gradual descent into the balls at one end, though others could march out to the white AstroTurf dock and jump in, in the more common manner of ball pits. There were also little docks: a circular one at one end and others around the grand marble Corinthian columns (the largest in any indoor building that really became part of the piece — and the only piece, other than people, with color). The first time I jumped in that opening morning, the balls were cool to the touch. Another time when I returned (the white turf a little scuffed from the wear, just as you might see at a beach), they seemed warmer. From all the body heat? Maybe. But probably from the skylights five stories up, which gave an interesting play of lights on the balls below. I came back when Alex was part of a two-man Snarkitecture team to deliver a lecture at the museum. Then, the audience filled with rightfully skeptical architecture students, let their pedantic learning melt as they jumped gleefully in, the years falling from their serious faces as they became kids again. The Snarkitecture team seemed like that too — they came down in an executive bus and had a cookout over at the house. You could see them reverting to childhood as they perfected just the right flip into the balls — all captured on super slo-mo apps on their cameras. It’s been a fun thing to have around for eight weeks. And now, it’s coming to an end. The paper did a story about all of the items that people lost there, at the bottom of the pits. The balls will go to some people developing an underground former Metro tunnel at DuPont Circle into an arts place; the idea may well spread elsewhere, having read or heard or seen the great success of public art installment in D.C., a place full of fine, free museums, where people were happy to stand in line for hours and pay to jump back into their childhood. And take a picture of it. This entry was posted in Art, Personally Speaking. Bookmark the permalink. Both comments and trackbacks are currently closed.